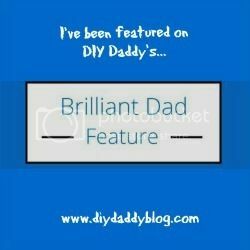 There's another dad blogger called Nigel, a lovely guy, his blog is called DIY Daddy and he's always doing interviews with other dads. I think that's very nice of him, particularly as I know exactly how hard it is to find time to write on top of being a parent - let alone blog about other people! This time it was my turn to be interviewed, so he asked me some questions about what it means to me to be a father. Head over to his blog here to read it! Click here!